QUESTION: I have a 5 year old boxer dog and my vet has advised I put her on a weight-loss programme. Please can you share your weight-loss tips with me? • Remember, a feeding guide is just that – a guide only. Some dogs will need significantly less than the guide states and some will need more. Your vet can help you to tailor your dog’s feeding guide, so it is unique to their needs, by adapting it after each of your pet’s weight and body condition assessments, where necessary. • Split your pet’s meals into at least 2 or 3 smaller daily rations. This will help to keep the hunger pangs at bay for longer. The digestive process itself uses energy, so the greater the number of small meals your dog has per day, the more energy they will use in digesting their food. • Weigh out your pet’s food at each meal – don’t use measuring cups as weighing is much more accurate. • Too rapid a weight-loss can be bad for your pet, so do make sure you monitor weekly weight-loss and discuss this with your vet. Most overweight dogs should safely be able to loose around 1-3% of their body weight per week (0.5-2% for cats), depending upon their vet’s recommendations. • If you must treat your pet, remember to cut down on the size of the treat and also to cut down on the size of the main meal accordingly. Or why not just save part of their daily food allowance to use instead of a treat, or reward them with your attention instead? 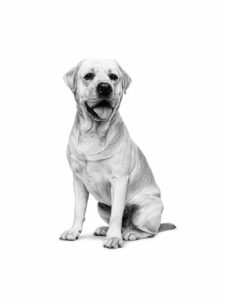 QUESTION: I want to keep my Labrador at the optimal body condition. However, I am slightly confused by the feeding guidelines on her bags of dry food. I am not sure exactly how much to feed based on the guide, there seems to be so many options! Can you advise? ANSWER: A feeding guide is just that – it is ONLY a guide which you will need to use as a base-line and then adapt to meet the needs of your pet. At ROYAL CANIN®, our feeding guides are based on how much to feed your pet over a 24 hour period and we would recommend you split this allowance into at least 2 meals per day. You need to feed your pet the amount of food (in grams) corresponding to their body weight when they are at their ideal body condition (which may be the weight they are now – but you should double check!). Most feeding guides will also show a range of amounts to feed, based on whether your pet is prone to carrying extra weight, being a normal weight or being on the thinner side of normal. Just follow the section of the guide that best suits your pet’s body condition. We would always recommend weighing your pet’s food out at every meal, as feeding in cup measurements is extremely inaccurate. For adult dogs, after a couple of weeks feeding, you should reassess your pet’s body condition score and body weight. If these values have remained stable, keep the amount you are feeding the same. If not, adjust the amount you feed your pet accordingly. You must also ensure your pet has continuous access to fresh drinking water. If your pet is significantly over or underweight, we would advise you consult their vet. Some feeding guides will also indicate how much to feed based on the amount of exercise your pet undertakes – again, just use this as a baseline as to the amount to start your pet on and adjust from there every 2 weeks until stable. For growing pets, consult your vet, breeder or specialist pet food retailer for advice, as you will need to adjust the amount they are fed as they grow, until they have reached their adult weight. © ROYAL CANIN® SAS 2014. All rights reserved.